3. URL of spoof website disguised as https://www.paypal.com/row/fq/ac=AwJ-RuvSFTGa4bxlyrysLp30USCiBpoj4PUKxXYf-xO2MTEuP0HxHd9txdfP.wel.1EK9ch2ilrriA&t=pr. This looks secure (https), but is NOT! 4. Real URL obviously NOT PayPal. 5. Website traced to Canada.
" Dear Paypal Customer, This email was sent automatically by the PayPal server to Verify Your Identity." 1. Click on the link below. If nothing happens when you click on the link (or if you use AOL), copy and paste the link into the address bar of your web browser. https://www.paypal.com/row/fq/ac=AwJ-RuvSFTGa4bxlyrysLp30USCiBpoj4PUKxXYf-xO2MTEuP0HxHd9txdfP.wel.1EK9ch2ilrriA&t=pr The link will take you to our Verify Your Identity page. 2. 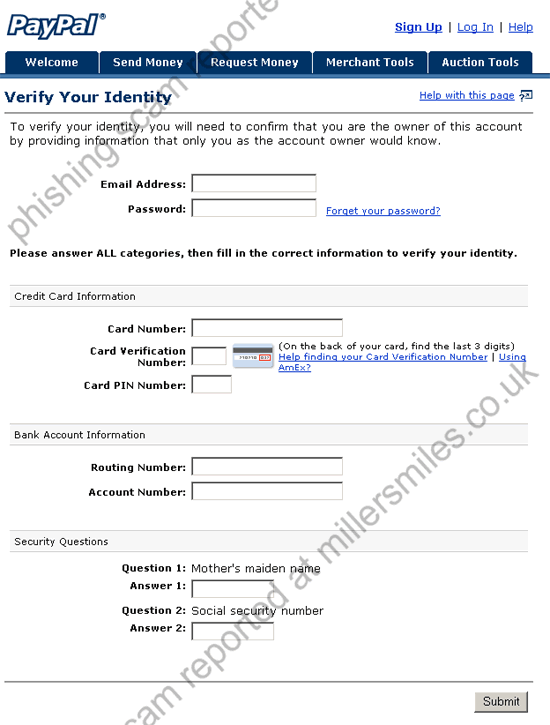 On the Verify Your Identity page, answer ALL of the questions, and click Submit. PROTECT YOUR PASSWORD NEVER give your password to anyone and ONLY log in at https://www.paypal.com/ . Protect yourself against fraudulent websites by opening a new web browser (e.g. Internet Explorer or Netscape) and typing in the PayPal URL every time you log in to your account.